My addiction to Magic began with the first Duels of the Planeswalkers game for the 360 back in 2009. Although it had its shortcomings (mana tapping, anyone? ), the DoTP series created an accessible way for new (or rusty) players to learn and play Magic before unleashing their skills onto the real world. Over the years the series has become more complex, trading in accessibility for customization -- most recently receiving criticism for players having to pay up for premium cards. Magic Duels: Origins revives the friendly, easy-to-pick-up experience from the DotP series, while merging it with the ever-trending (and seemingly undead) free-to-play model. In this edition however, players can choose to earn their rewards by playing through various modes instead of dishing out cash for premium cards (unless that’s the preference, of course). As its name implies, the story mode within Magic Duels: Origins centers on the early lives of well-known Planeswalkers in the series -- including Jace, Chandra, and Liliana. Each backstory is broken down into five chapters, which detail coming-of-age moments in their lives before becoming full-fledged Planeswalkers. Chapters begin with a short prologue and art piece which set the stage for the upcoming duel, and upon completion end in a similar vein. Battle Mode is the main attraction, containing the normal modes you’d find in any Magic game -- Versus battle (vs Human), Solo battle (vs AI), and Two-headed Giant (2v2). Solo battles come in three flavors -- easy, medium, hard -- however, you’re not able to select your AI opponent (the deck is random). It’s also unclear how the matching system works for the Versus battle system, since the servers were down the majority of the time and I wasn’t able to test it out. 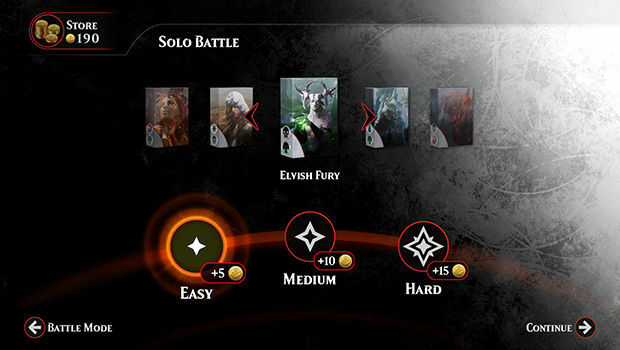 I also found it unfortunate that there are no extra fun modes present, as was common in the DoTP series (like Planechase or Archenemy), which I personally miss. 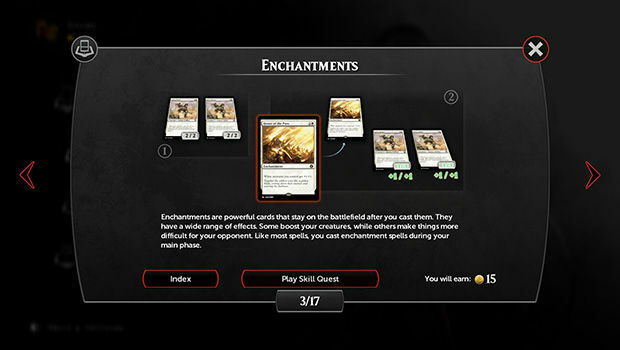 In Origin’s free-to-play model, players collect coins via completion of Story and Battle duels or by shelling out cash. Coins are then used to trade in for booster packs, which are added to your overall collection. A single booster pack runs for 150 coins, which equals roughly $2.00 if you were to purchase the coins yourself. You can also buy coins in bulk at a discount, going all the way up to 7,500 coins for $39.99. Origins makes it surprisingly easy to collect coins -- completing a Planeswalker’s story (5 duels) is enough to get you a pack, or dueling a random human roughly 7 times could net the same amount. Quests, which are essentially achievements, rotate in and out and dish out coins when certain stipulations are met (for example: win two duels with a forest/mountain combo deck, put 20 +1/+1 counters on a creature, et cetera). After only a few hours of playing through some of the story, a few battles, and earning Quest achievements, I had enough coins to unlock 3 or 4 packs. I was surprised that the built-in cards were fairly solid (and a lot of new ones, to boot). 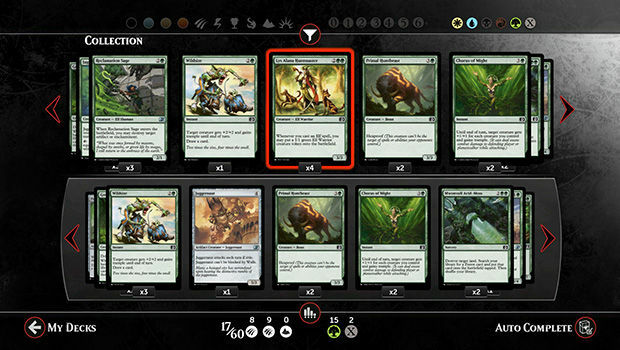 Origins also features Planeswalker cards, an added layer of challenge which is also a first for Magic’s online games. It didn’t take me long to build some decent decks after opening a few booster packs, although with 251 total cards and only 6 cards in a pack collecting them all seems daunting. Deck-building has come a long way since the Duels of the Planeswalkers series was first introduced. 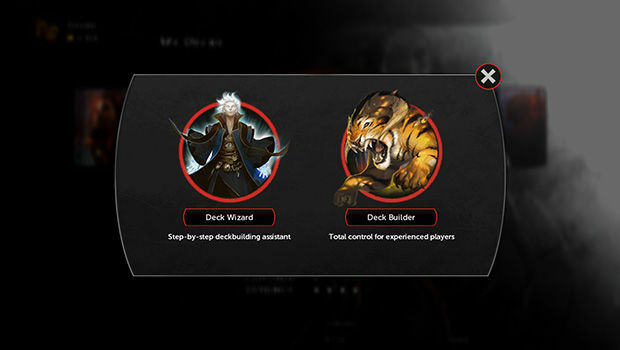 In Origins, the two options are to build everything from scratch or to use the deck wizard. Building a deck from scratch gives players pretty much any freedom they need when building a deck -- it even has a nice filter system, allowing players to sort by parameters including rarity, type, and cost. Swapping cards in and out is pretty seamless, and I like that I could go through my booster cards to pick out the ones I want and have the game do the math and complete the rest of the deck for me. The deck wizard is much more restrictive, but probably the best option for brand new players. After selecting mana types, it walks players through three steps and explains which cards to choose along the way. Being a casual player who doesn’t really enjoy building decks, I actually found the deck wizard to be even more overwhelming than the “build from scratch” option. It’s oddly restrictive, as it doesn’t really give you much room to look at your available cards -- each step only displays a handful of cards to choose from at any given time. Although Origins has a number of viable options for deck-building, there were a few strange occurrences I noticed when building decks. When using autocomplete in the deck-builder, sometimes odd choices would be made -- for example, a lone forest land card would be slotted in when no forest mana was needed, or a card that calls for enchantments when none were found in the deck. Origins also makes it difficult to rebuild a deck if it was originally made with the wizard, as you’re not able to switch freely between modes. This means that if you get new cards in your booster pack that you want to add to your decks built with the wizard, you’re pretty much out of luck. My attempts to join a multiplayer duel over the course of two days were pretty much thwarted with network errors, which is a real bummer seeing how playing with actual people is the crux of playing Magic. I also found that occasionally the game would boot me out of the server entirely, rendering my account virtually useless. Hopefully Stainless will be able to sort out the server issues, as the game does not allow you to collect or spend coins, even in Story mode or AI battles. This is quite frustrating since the main purpose of the game is to collect these coins to spend them on booster packs and improve your deck. I also found it disappointing that you’re not able to earn coins via playing with friends. I’m assuming this is because it would be much easier to cheat the system, however, even giving small rewards via Quests, or a small amount of coins seems like it would encourage more friendly duels versus people taking advantage. 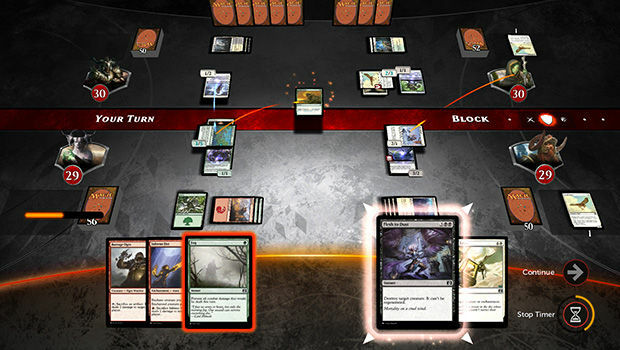 Despite their servers not being ready, I feel Magic Duels: Origins brings the best of both worlds together, finally: a fun way to learn and play Magic with the competitiveness of collecting and putting together strong decks for duels in a fairly balanced system. I’m giving it the benefit of the doubt, hoping that the server issues improve with time, but in the meantime playing through the story and battling AI is still entertaining. Those new to Magic will find it easy to dive in and learn the intricacies of deck-building, while more experienced players should finally have the customization and card variety they’ve been asking for. Nothing beats the real thing (playing in person) for a lot of expert Magic players; however, I feel like this is a big step in the right direction.